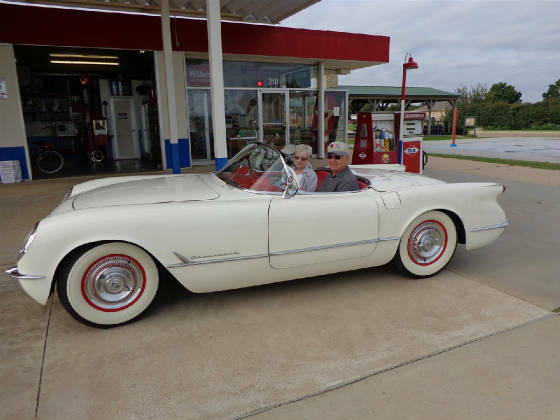 This month’s Great Oklahoma Classic is truly an American Classic, a first generation 1954 C1 Chevrolet Corvette that belongs to Jim and Jo Lunsford of Stillwater Oklahoma. Jim found this classic C1 in the June 1997 issue of Hemmings Motor News. The ad was short: “complete, runs, and restorable.” This was the vehicle that Jim had been thinking about since he had recently retired. After several phone conversations Jim bought the car in the ad – sight unseen- (to his wife’s amazement) and had it shipped from California to their home in Stillwater in July of 1997. In 1954 Jim and Jo were high school juniors. It was love at first sight for the girl and the car. Jim married Jo, his dream girl, as soon as he could but had to wait 43 years before he had enough time and money to by his dream car. The first C1's were made in 1953 and only 300 were produced. This limited production makes the 1953 Corvettes very expensive and very difficult to find if not impossible. 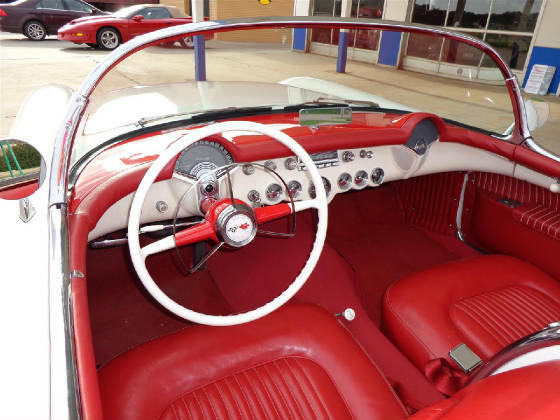 The 1955 Corvettes are also very expensive due to the 700 total production run and the first Corvettes with V8 motors. Jim says the 1954 Corvettes were much more obtainable due to the 3,640 production run and much less expensive. 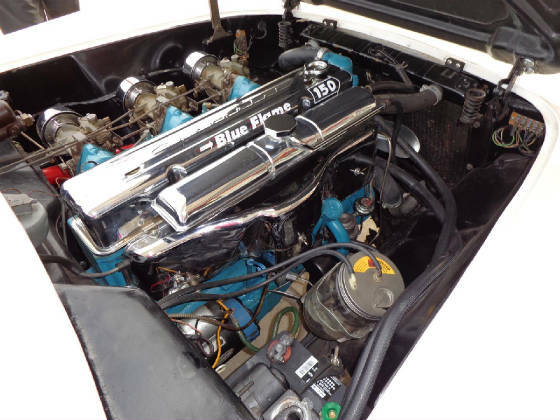 All of the 1954 Corvettes had the 235 cubic inch Blue Flame (inline 6) engine overhead valve that produced 150 horsepower. 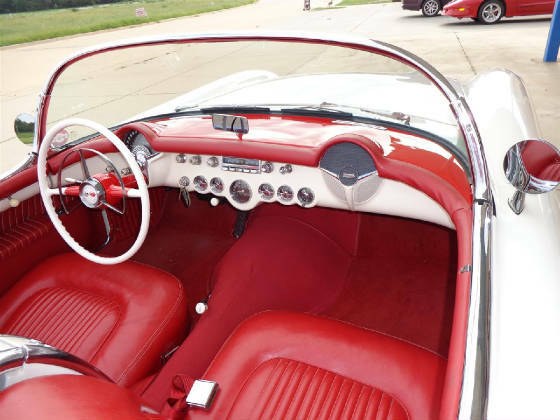 All of the 1954 Corvettes had a two speed power glide transmission with floor shift. The great adventure began when Jim and Jo met the delivery driver east of Stillwater and watched the old C1 back down the ramp. They were able to see the Corvette for the first time. Jo says it was an eye full! The trunk was held in place with duct tape and the interior was a mess! The driver sprayed a little ether into the carbs and the Blue Flame 6 started right up. It was very loud due to the missing exhaust system which was long gone. The driver then aired up the tires and told them he had driven the car onto the truck and that they should have no trouble driving it home. They had not traveled far when a tire went flat and they pulled to the side of the road near 19th Street and Country Club Road. No top, no spare, no jack and 101 degree temperature! Jo could not believe they were leaving their treasure on the side of the road to go find a tire. What a beginning! 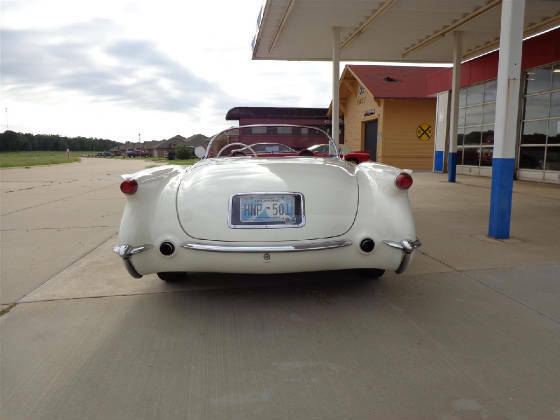 Jim spent the first full year of his retirement restoring the car to this beautiful state. 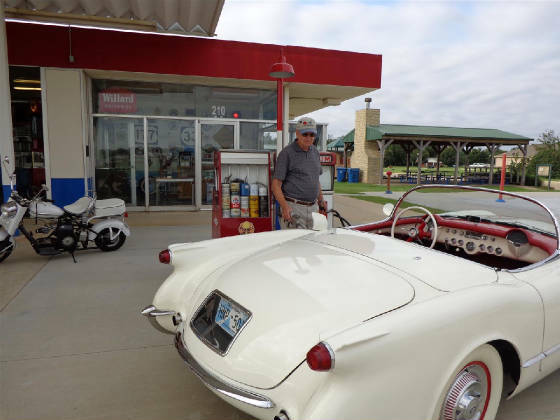 He did a body-off complete restoration right in his garage, moving the Corvette in and out of the garage for different phases of the restoration. He took a class in college to learn about fiberglass repair, but says he learned a lot more in this first year of working on the classic. He enrolled in Auto Body and Paint at the local Vo-tech. 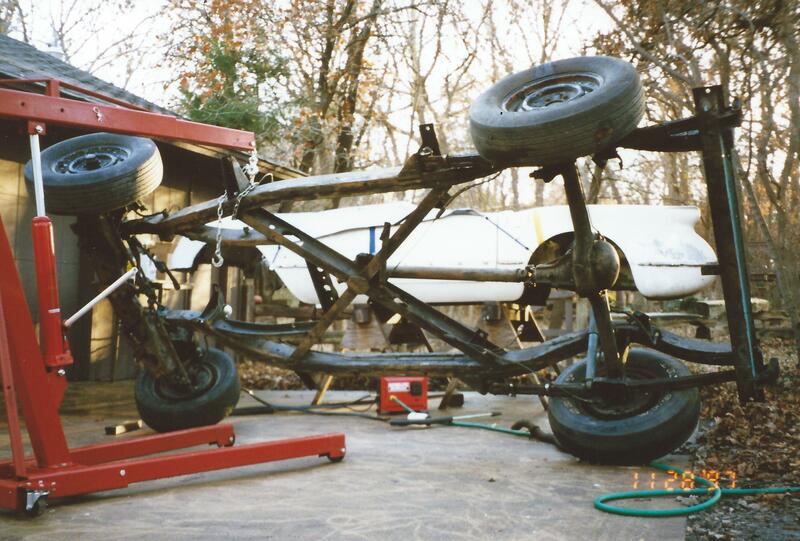 Jim removed the body from the frame and painted the car in his home garage. BEFORE! 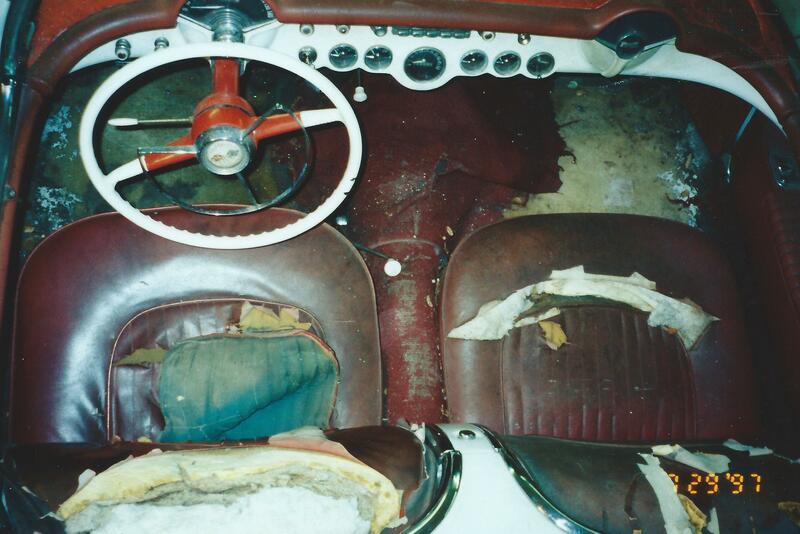 Jo almost cried when she first saw the interior of the old Corvette. AFTER! 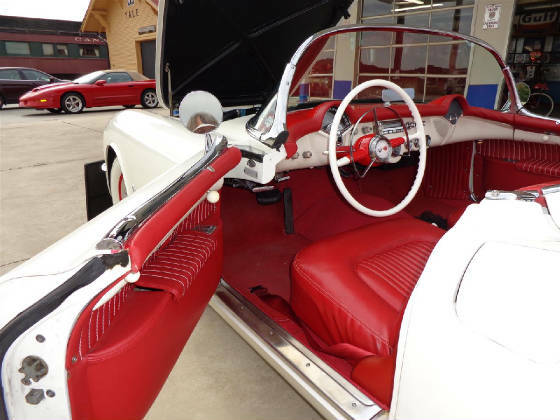 The beautiful interior of this classic was restored by Kevin Collin of Stillwater. When Jim began taking the engine apart it appeared to not have any wear on the main bearings or the cylinders. 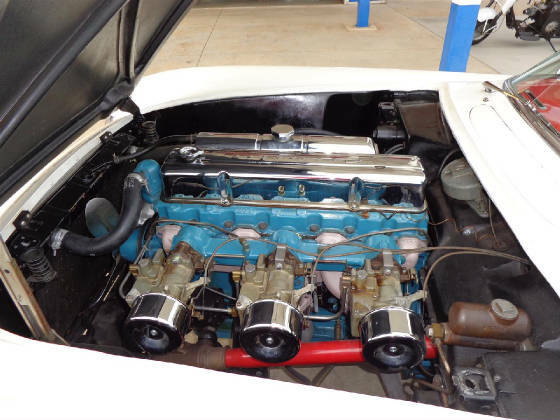 He contacted a previous owner and was told there had been a complete overhaul done to the engine, transmission and brakes fifteen years ago and the car had only been driven 300 miles since. This was a great day! The only reason Jim was able to talk to the owner that had overhauled the Corvette was by sheer luck. While disassembling the car Jim found a very old gasoline credit card under the seat. The date on the credit card was 1972 and the name was E. B. Gardner from Oregon. Oh! Those marvelous computers! Jim was able to contact the man on the card and ‘YES’ it was a previous owner! Mr. Gardner was excited to hear about the car and that it was being restored. 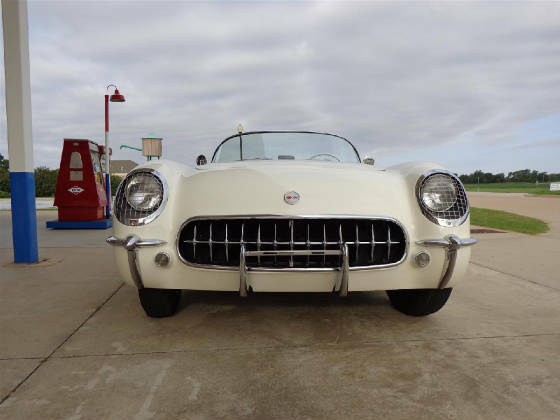 Mr. Gardner had decided back in 1995 that he would not be able to restore the car so he sold it to a dealer who put it in an auction and it was sold to a Joe Calcagno, a Corvette enthusiast, who bought it to be saved from being sold for parts. Mr. Calcagno was the one who listed the old Corvette in the Hemmings Motor News. 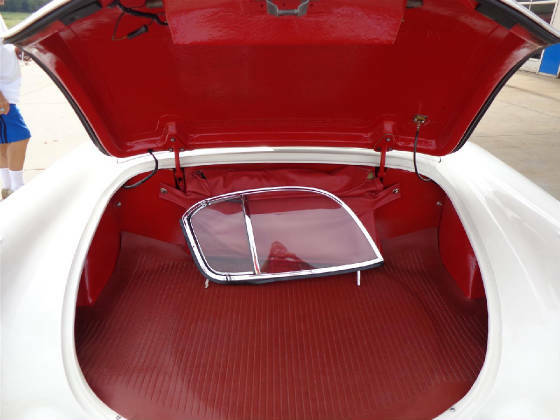 The snap-in side windows are stored when the top is off in a holder in the trunk. 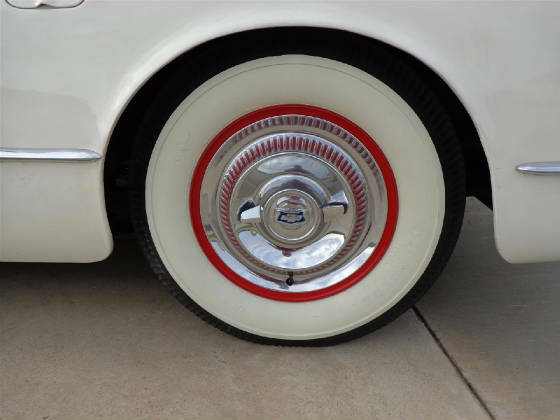 The wide white wall tires on the classic are 670/15 Firestones mounted to the original red wheels with the stock Corvette hub caps. What a classic look! 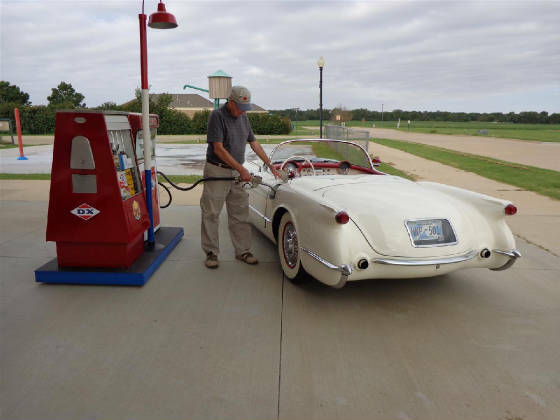 Jim filling up the classic with a tankful of that premium grade fuel DX SUPER BORON at the Cimarron Starlite Cruisers' club house in the Oklahoma Territorial Plaza. 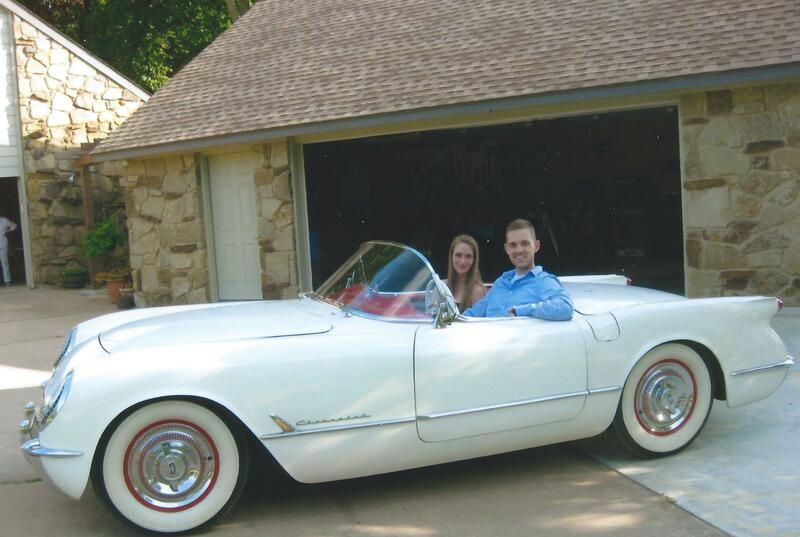 Jim and Jo Lunsford’s 1954 Corvette is still making a lot of great memories! Thanks for sharing this great story with us! 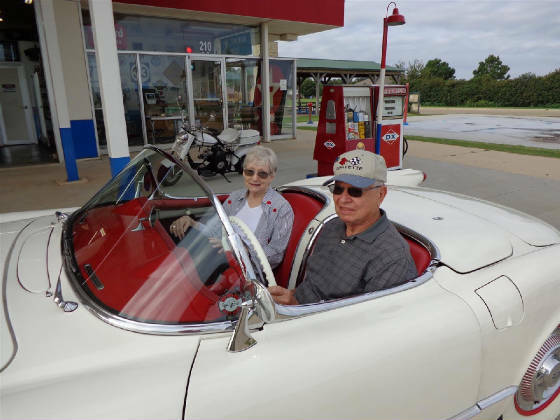 The Cimarron Starlite Cruisers sincerely appreciate Jim and Jo Lunsford of Stillwater Oklahoma for sharing their 1954 Chevrolet Corvette as our Great Oklahoma Classic for September 2017!